It is very important for your child to get the proper exercise a need on a regular basis. Many children opt for playing outdoor sports that can be very beneficial for them. However, there are several outdoor sports that can be dangerous at times and can even cause great injury to your child. According to Medline Plus, some of the most common sports injuries that can occur include: sprains and strains, knee injuries, swollen muscles, Achilles tendon injuries, pain along the shin bone, rotator cuff injuries, fractures and dislocations. It is very important to educate your child and how to properly care for their sports injuries. You have to try to convince your child that when they experience any type of pain or injury, they need to stop playing. If they continue to play their sports, they may cause further injury. If you become aware that your child has severely injured themselves playing sports, you can start treatment with properly icing their injuries. 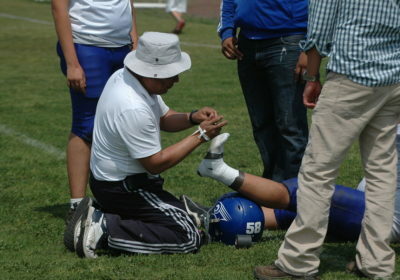 Many times, icing their injuries is not enough and they will need to seek medical attention. Getting your child assistance from a pediatric sports physician can help to reduce their sports injuries significantly and rapidly. According to the III, in the year of 2015, there were more than 51 percent of football injuries that happened in children that were age 5 to 14 years old. In addition, there were also 79 percent of gymnastic injuries, 51 percent of baseball injuries and 40 percent of track injuries, that were all injuries that required treatment in the emergency rooms. If your child is involved in any type of sports, it is critical that you help them learn the proper way of conducting themselves out in the sports fields. There are professionals who can properly assist your child to learn techniques and methods to preventing themselves from getting physically hurt. Many times, sports injuries cannot be prevented and they all occur on an accidental basis. If you have found that your child is constantly becoming injured in their Sports, you may want to consider taking your child to a sports medicine physician. There are many pediatric sports medicine physicians out there that can help your child learn the proper techniques and methods to preventing injuries. If you have dealt with your child continuously becoming injured after sports, considered helping your child by taking them to see a professional. Though, many injuries cannot be prevented, you can definitely try to help them by learning better techniques to move their bodies. You can also help your child learn how to properly care for their injuries and to reduce further injury, while being out on the field. You can start your search for a pediatric sports medicine physician by conducting an online search for: podiatric sports medicine elmhurst il. Overall, it is never easy dealing with your child becoming injured. In order to help your child get the care that they need, consider taking them to a pediatric sports medicine physician. Not only will your child receive the treatment they need, but they may be able to learn proper techniques on how to prevent further injuries.